The North Carolina Coastal Federation seeks to involve the community in collecting marine debris to protect our local wildlife and salt marshes. This helps protect local wildlife, salt marshes and marine life. Our cleanups would not be possible without the help of our wonderful volunteers. Every year, we host community organizations, school groups and college groups from around the country to come help keep the North Carolina coast safe and beautiful. Along our coast, litter is dangerous to wildlife that mistake litter for food or become entangled in trash items. It is also a hazard to humans and hurts our economy. damages our economy as it degrades the beauty of the coast. Coastal cleanups continue throughout the year. 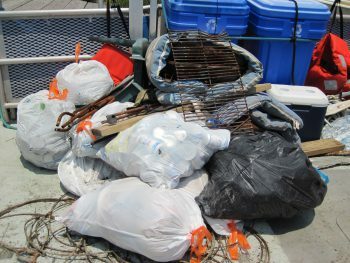 Stay updated below and at nccoast.org/events for cleanups in your region! If you have a group that is interested in cleaning up our coast or if you are aware of an area along the central coast that is in need of a cleanup, please call 252-393-8185. Check out the different cleanup projects going on in your region! You can help clean up our coast! In January 2016, the federation conducted a cleanup at Wanchese Harbor in partnership with Dare County, North Carolina Sea Grant, The Nature Conservancy and the National Oceanic and Atmospheric Association (NOAA) Marine Debris Program. The cleanup was a kickoff for the crab pot cleanup in 2016 as part of the federation’s crab pot restoration program. The cleanup brought in 45 wonderful federation volunteers who removed 700 pounds of plastic, which was recycled by Dare County Public Works. The group of volunteers also picked up 2.69 tons of other debris items, which included various amounts of wood debris, an ice machine, tables, chairs, bins, tarps and buckets. Read more about the cleanup. The northeast office has worked with various town groups, colleges and community organizations. 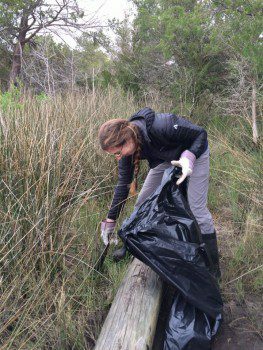 The federation’s Coastal Marsh Cleanup Program seeks to involve the community in collecting marine debris to protect our local wildlife and salt marshes. The program has been tremendously successful, making a dent in the amount of debris that accumulates along our coast. I n the southeast office, the federation conducts cleanups at Morris Landing and Carolina Beach State Park. In 2016, a group of students from James Madison University spent spring break with the federation, where they helped with cleanups in these areas. One community group that the office has collaborated with is the Wilmington Regional Association of Realtors on Realtor Action Day, which had 580 volunteers in 2016. This number was up from the 400 in 2015. The group braved cold weather, gale winds and high tide at Carolina Beach State Park to pick up about 150 pounds of marine debris during the shoreline cleanup. In celebration of National Estuaries Week, there will be a cleanup at Carolina Beach State Park. As part of the crab pot project, the office is also planning a clean up at Morris Landing in the future.